I've been told by a handful of people to watch this (especially from Blodeuedd ;D). This popped up on Netflix so why not? I honestly didn't know what this movie was about. I didn't read the summary or watch any trailers so I got to watch this with fresh eyes and no idea what was going to happen. Yes, this was cute, funny, and that baby made me laugh. Baldwin's voice coming out of that big-eyed cute baby. Loved it. I loved the whole storyline and I felt so bad for the older brother. I was a single child so I can't imagine being old enough to have my parents love and then a baby coming into the picture. And a weird, talking baby at that! 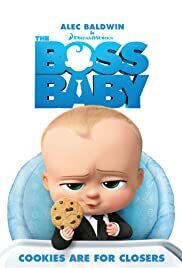 Fun movie that adults and kids can watch. There is some adult humor that is so subtle that only us adults will understand. Our little inside jokes. In the end, this was a fun movie. I recommend it if you are looking for a fun film that will make you laugh, awww, and feel sympathy. Good lessons are there too! I'll give this 5 stars. Cool. I plan on watching this soon as it is one of the Oscar nominees too.